I found another picture of us from Sunday's protest, on the web here. If this isn't enough to warrant being tracked by the Kochtopus, I'll be very disappointed! 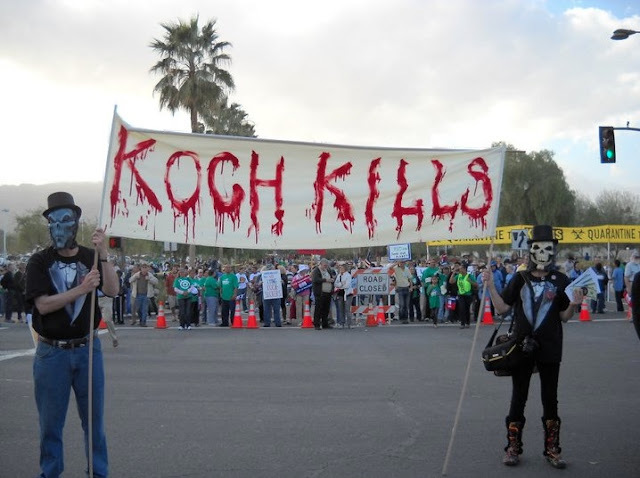 Koch Brothers Hired Goons to Track and Threaten Critics and Reporters? We talked over the weekend about the David and Charles Koch's latest meeting, held at a posh resort near Palm Springs, where the billionaire conservatives gathered with powerful far-right officials to raise money and plot strategy. If you didn't hear much about it, that's not an accident -- the discussions are held behind well-protected closed doors, and journalists are strictly prohibited from attending sessions. Kenneth Vogel reported today on the Koch Bros' larger media strategy. It apparently involves an aggressive public-relations effort, reaching out to reporters to "shape their Koch coverage," while using a "private security detail" to play "hard ball with critics and suspected foes." In particular, Vogel noted the events in California over the weekend, with Koch-paid guards tracking resort guests deemed "suspicious," and erecting a blockade to prevent cameras from filming arriving guests. Security manned every doorway and stairwell near the ballrooms where Koch events were held, and threatened to jail this POLITICO reporter while he waited in line at the resort's cafe, after he stopped by a Koch conference registration table. The resort grounds were "closed for a private function," the resort's head of security, James Foster told POLITICO, ushering the reporter outside, whereprivate security guards, wearing gold lapel pins bearing Koch's "K" logo, threatened "a citizen's arrest" and a "night in the Riverside County jail" if the reporter continued asking questions and taking photographs. The Kochs already have a reputation for being overly-secretive and heavy-handed in their tactics. I don't imagine threatening a journalist while he waited in line at a hotel cafe is going to help. As Jon Chait joked, "If those hired goons don't dispel the image of the Kochs as sinister moguls, I don't know what will." This meeting warranted the attendance of James Bond. But which side would the secret agent be fighting for, the status quo or the health of the biosphere? In hard times there is always plenty of money to hire goons. And plenty of hard up ideologues to man the thug line. In Egypt we are seeing the future of selective enforcement. The police arrest demonstrators who are possibly breaking the law. Hired thugs pick out the leaders and independent press people and intimidate or beat them. Other thugs act as agent provocateurs The police ignore the illegal actions of the hired thugs. The government and police can deny that they had anything to do with the intimidation and beatings. The MSM won't question the government or police because clearly they did nothing. Time for a counter strategy. Where do people of their age find the motivation to keep pressing onwards with their agenda's? Aren't they in their 70's? They can't take the money with them.. can they? So odd.